though you know and are established in the Present Truth. What Does the Everlasting Gospel Affirm? "The Present Truth Magazine Confession of Faith"
The Proclamation of the Gospel to All the World: Because of His infinite love for the fallen sons and daughters of Adam, God Himself in the person of our Lord Jesus Christ has come into this sin-darkened world, lived a sinless, spotless life by perfectly obeying and fulfilling the Law of God, and then He suffered and died for our sins, in our place, as our atoning sacrifice upon the cross of Calvary. As the Second Adam, our Lord took upon Himself the legal guilt, punishment, penalty, suffering and death which we all deserve. The curses pronounced at the Fall of the First Adam, fell in full measure upon the Second Adam, the Lord Jesus Christ. In Christ, God has provided a sin bearer, substitute, and redeemer for the entire human family. He alone as the divine Son of God could have offered to the holy Law of God a righteousness equal to its broadest demands for perfect righteousness. 2.) Passive obedience — The Law of God also requires punishment and death for all who sin and come short of its righteous demands. This legal penalty Jesus bore for us when He suffered and died for us, in our place at Calvary. The guilt of all the world was reckoned and imputed to Him while He hung upon the cross. Imputed Righteousness: the rock of offense — Jesus Christ: the meritorious cause (or the legal basis) of acceptance with God: In His sinless life and atoning death on the cross, God has provided a divine legal substitute, legal representative, and Second Adam for every fallen child of Adam. He was reckoned and treated as a sinner in the eyes of Divine justice so that by God's unmerited grace alone, in Christ alone, salvation from the penalty of sin has been made available for all the world. In Christ God has provided a ransom for all of humanity by paying the legal debt of all. The Lord Jesus Christ lived a sinless life, suffered and died as an atoning sacrifice for the sins of the world, arose again from the dead, and ascended into Heaven where He ever lives as the one High Priest and mediator who intercedes in the most holy place of the heavenly sanctuary to save all who call upon His name for forgiveness and eternal life. Faith in Christ: the instrumental cause (the personal response ) for acceptance with God: All who through the drawing power of the Holy Spirit personally respond to the gospel and personally call upon the name of the Lord Jesus Christ in repentance for their sins are legally exonerated and justified freely by God's unmerited grace alone (undeserved acceptance) through faith alone (personal trust) in the perfect sinless life and atoning death of the Lord Jesus Christ alone. They are justified, forgiven, declared righteous and innocent, accepted, pardoned, perfected, saved, elected, set free from condemnation, reconciled, accounted righteous, chosen, adopted, purged, delivered from death and made alive, atoned for, found, brought back, bought back, made nigh, and predestined unto life eternal in Christ. By the unmerited grace of God they are accounted perfect and sinless in His merciful reckoning; and their sinfulness and guilt are covered by His sinlessness. The Law of God finds nothing to condemn in the repentant sinner who believes and continues to believe in Jesus. The repentant sinner is reckoned as sinless through the imputed righteousness of Christ and his name is recorded in the Book of Life. He is reckoned as righteous in Christ and accounted worthy of eternal life. This is what the apostle Paul calls justification by faith in Christ (Righteousness by Faith). Christ ever lives to make intercession for repentant believers as the one and only mediator between God and Man. On the Last Day He will come again to give eternal life to all who eagerly await His return. The Tree of Life Those who falsely teach that all men are immortal by nature because humans supposedly have an "immortal soul" or "immortal spirit" which can never die are merely echoing the lie of the Deceiver in the Garden of Eden, "Ye shall NOT surely die". We are told in the word of God that God only has immortality. 1Timothy 6:15 ...who is the blessed and only Potentate, the King of kings, and Lord of lords 16 who only hath immortality, dwelling in light unapproachable; whom no man hath seen, nor can see: to whom be honor and power eternal. The saints will have immortality at His coming when "this mortal shall put on immortality" BUT only because we will again have access to the tree of life by God's unmerited grace alone. 1 Corinthians 15:51-57 51 Behold, I shew you a mystery; We shall not all sleep, but we shall all be changed, 52 In a moment, in the twinkling of an eye, at the last trump: for the trumpet shall sound, and the dead shall be raised incorruptible, and we shall be changed. 53 For this corruptible must put on incorruption, and this mortal must put on immortality. 54 So when this corruptible shall have put on incorruption, and this mortal shall have put on immortality, then shall be brought to pass the saying that is written, Death is swallowed up in victory. 55 O death, where is thy sting? O grave, where is thy victory? 56 The sting of death is sin; and the strength of sin is the law. 57 But thanks be to God, which giveth us the victory through our Lord Jesus Christ. Revelation 2:7 "He that hath an ear, let him hear what the Spirit saith unto the churches; To him that overcometh will I give to eat of the tree of life, which is in the midst of the paradise of God." "And the LORD God said, Behold, the man is become as one of us, to know good and evil: and now, lest he put forth his hand, and take also of the tree of life, and eat, and live for ever: Therefore the LORD God sent him forth from the garden of Eden, to till the ground from whence he was taken. So he drove out the man; and he placed at the east of the garden of Eden Cherubims, and a flaming sword which turned every way, to keep the way of the tree of life." Read the following quote from Genesis 5:5-20, 25-31. From the meaning of the words high-lighted in red. Do you think that the Lord might be trying to tell us something about what happened to the human family when, as a result of the Fall, it was denied access to the tree of life??? "And all the days that Adam lived were nine hundred and thirty years: and he died. And Seth lived an hundred and five years, and begat Enos: And Seth lived after he begat Enos eight hundred and seven years, and begat sons and daughters: And all the days of Seth were nine hundred and twelve years: and he died. And Enos lived ninety years, and begat Cainan: And Enos lived after he begat Cainan eight hundred and fifteen years, and begat sons and daughters: And all the days of Enos were nine hundred and five years: and he died. And Cainan lived seventy years, and begat Mahalaleel: And Cainan lived after he begat Mahalaleel eight hundred and forty years, and begat sons and daughters: And all the days of Cainan were nine hundred and ten years: and he died. And Mahalaleel lived sixty and five years, and begat Jared: And Mahalaleel lived after he begat Jared eight hundred and thirty years, and begat sons and daughters: And all the days of Mahalaleel were eight hundred ninety and five years: and he died. And Jared lived an hundred sixty and two years, and he begat Enoch: And Jared lived after he begat Enoch eight hundred years, and begat sons and daughters: And all the days of Jared were nine hundred sixty and two years: and he died." "And Methuselah lived an hundred eighty and seven years, and begat Lamech: And Methuselah lived after he begat Lamech seven hundred eighty and two years, and begat sons and daughters: And all the days of Methuselah were nine hundred sixty and nine years: and he died. And Lamech lived an hundred eighty and two years, and begat a son: And he called his name Noah, saying, This same shall comfort us concerning our work and toil of our hands, because of the ground which the LORD hath cursed. And Lamech lived after he begat Noah five hundred ninety and five years, and begat sons and daughters: And all the days of Lamech were seven hundred seventy and seven years: and he died." Luke 7:12-15 "Now when he came nigh to the gate of the city, behold, there was a dead man carried out, the only son of his mother, and she was a widow: and much people of the city was with her. And when the Lord saw her, he had compassion on her, and said unto her, Weep not. And he came and touched the bier: and they that bare him stood still. And he said, 'Young man, I say unto thee, Arise.' And he that was dead sat up, and began to speak. And he delivered him to his mother." Luke 8:52 And all were weeping, and bewailing her: but he said, Weep not; for she is not dead, but sleepeth. 53 And they laughed him to scorn, knowing that she was dead. 54 But he, taking her by the hand, called, saying, Maiden, arise. 55 And her spirit (pneuma - breath) returned, and she rose up immediately: and he commanded that something be given her to eat. 56 And her parents were amazed: but he charged them to tell no man what had been done. Matthew 9:18-19, 23-26 "While he spake these things unto them, behold, there came a certain ruler, and worshipped him, saying, 'My daughter is even now dead: but come and lay thy hand upon her, and she shall live.' And Jesus arose, and followed him, and so did his disciples. And when Jesus came into the ruler's house, and saw the minstrels and the people making a noise, He said unto them, Give place: for the maid is not dead, but sleepeth. And they laughed him to scorn. But when the people were put forth, he went in, and took her by the hand, and the maid arose. And the fame hereof went abroad into all that land." Now let's look at how Paul viewed death. When did he teach that believers shall become immortal? At the moment of death? or at the moment of the second coming of Christ on the Last Day? Notice his counsel to the Corinthian church and how he views death, immortality, and the resurrection on the Last Day. There is not even a hint that Paul looked to go to heaven as a bodiless "spirit". Paul's hope is for the resurrection at the Last Day as the reward of the believer in Christ!! 1 Thessalonians 4:13 But I would not have you to be ignorant, brethren, concerning them which are asleep, that ye sorrow not, even as others which have no hope. 14 For if we believe that Jesus died and rose again, even so them also which sleep in Jesus will God bring with him. 15 For this we say unto you by the word of the Lord, that we which are alive and remain unto the coming of the Lord shall not prevent (precede) them which are asleep. 16 For the Lord himself shall descend from heaven with a shout, with the voice of the archangel, and with the trump of God: and the dead in Christ shall rise first: 17 Then we which are alive and remain shall be caught up together with them (the resurrected believers) in the clouds, to meet the Lord in the air: and so shall we ever be with the Lord. 18 Wherefore comfort one another with these words. 1 Corinthian 15:12 Now if Christ be preached that he rose from the dead, how say some among you that there is no resurrection of the dead? 13 But if there be no resurrection of the dead, then is Christ not risen: 14 And if Christ be not risen, then is our preaching vain, and your faith is also vain. 15 Yea, and we are found false witnesses of God; because we have testified of God that he raised up Christ: whom he raised not up, if so be that the dead rise not. 16 For if the dead rise not, then is not Christ raised: 17 And if Christ be not raised, your faith is vain; ye are yet in your sins. 18 Then they also which are fallen asleep in Christ are perished.... 19 If in this life only we have hope in Christ, we are of all men most miserable. 20 But now is Christ risen from the dead, and become the first fruits of them that slept. 21 For since by man came death, by man came also the resurrection of the dead. 22 For as in Adam all die, even so in Christ shall all be made alive. 23 But every man in his own order: Christ the first fruits; afterward they that are Christ's at his coming. 24 Then cometh the end, when he shall have delivered up the kingdom to God, even the Father; when he shall have put down all rule and all authority and power. 25 For he must reign, till he hath put all enemies under his feet. 26 The last enemy that shall be destroyed is death. 27 For he hath put all things under his feet. But when he saith all things are put under him, it is manifest that he is excepted, which did put all things under him. 28 And when all things shall be subdued unto him, then shall the Son also himself be subject unto him that put all things under him, that God may be all in all. 29 Else what shall they do which are baptized for (Greek:huper — concerning, dealing with, referring to) the dead, if the dead rise not at all? why are they then baptized for (Greek:huper — concerning, dealing with, referring to) the dead? In verse 29, Paul is saying that those baptized Christians who have died in the faith would have no hope if the dead rise not. Their hope is in the resurrection, not in a conscious "spirit" existence apart from the body!!! 30 And why stand we in jeopardy every hour? 31 I protest by your rejoicing which I have in Christ Jesus our Lord, I die daily. 32 If after the manner of men I have fought with beasts at Ephesus, what advantageth it me, if the dead rise not? let us eat and drink; for tomorrow we die. 33 Be not deceived: evil communications corrupt good manners. 34 Awake to righteousness, and sin not; for some have not the knowledge of God: I speak this to your shame. 35 But some man will say, How are the dead raised up? and with what body do they come? 36 Thou fool, that which thou sowest is not quickened (made alive), except it die: 37 And that which thou sowest, thou sowest not that body that shall be, but bare grain, it may chance of wheat, or of some other grain: 38 But God giveth it a body as it hath pleased him, and to every seed his own body. 39 All flesh is not the same flesh: but there is one kind of flesh of men, another flesh of beasts, another of fishes, and another of birds. 40 There are also celestial bodies, and bodies terrestrial: but the glory of the celestial is one, and the glory of the terrestrial is another. 41 There is one glory of the sun, and another glory of the moon, and another glory of the stars: for one star differeth from another star in glory. 42 So also is the resurrection of the dead. It (the body: see verse 35) is sown in corruption; it is raised in incorruption: 43 It is sown in dishonour; it is raised in glory: it is sown in weakness; it is raised in power: 44 It is sown a natural body; it is raised a spiritual body. There is a natural body, and there is a spiritual body. 45 And so it is written, The first man Adam was made a living soul; the last Adam was made a quickening (life-giving) spirit. 46 Howbeit that was not first which is spiritual, but that which is natural; and afterward that which is spiritual. 47 The first man is of the earth, earthy: the second man is the Lord from heaven. 48 As is the earthy, such are they also that are earthy: and as is the heavenly, such are they also that are heavenly. 49 And as we have borne the image of the earthy, we shall also bear the image of the heavenly 50 Now this I say, brethren, that flesh and blood cannot inherit the kingdom of God; neither doth corruption inherit incorruption. When does the Christian receive the glorified spiritual body? At the resurrection!! Notice that Paul does not say that we will be "spirits" in heaven. He says that we will have a spiritual or heavenly body just as our Lord had a glorified heavenly body after his ascension into heaven to sit on His Father's throne. Paul is NOT even suggesting that we will be merely spirits. 1 Corinthians 15:51 "Behold, I shew you a mystery; We shall not all sleep, but we shall all be changed, in a moment, in the twinkling of an eye, at the last trump: for the trumpet shall sound, and the dead shall be raised incorruptible, and we shall be changed. For this corruptible must put on incorruption, and this mortal must put on immortality. So when this corruptible shall have put on incorruption, and this mortal shall have put on immortality, then shall be brought to pass the saying that is written, Death is swallowed up in victory. O death, where is thy sting? O grave, where is thy victory? The sting of death is sin; and the strength of sin is the law. But thanks be to God, which giveth us the victory through our Lord Jesus Christ." 1 Corinthians 15:21 "For since by man came death, by man came also the resurrection of the dead. For as in Adam all die, even so in Christ shall all be made alive. But every man in his own order: Christ the first fruits; afterward they that are Christ's at his coming." 2 Corinthians 4:14ff "Knowing that he which raised up the Lord Jesus shall raise up us also by Jesus, and shall present us with you. 15 For all things are for your sakes, that the abundant grace might through the thanksgiving of many redound to the glory of God. 16 For which cause we faint not; but though our outward man perish, yet the inward man is renewed day by day. 17 For our light affliction, which is but for a moment, worketh for us a far more exceeding and eternal weight of glory; 18 While we look not at the things which are seen, but at the things which are not seen: for the things which are seen are temporal; but the things which are not seen are eternal. 5:1 For we know that if our earthly house of this tabernacle were dissolved, we have a building of God, an house not made with hands, eternal in the heavens. 2 For in this (body) we groan, earnestly desiring to be clothed upon with our house which is from heaven: 3 If so be that being clothed we shall not be found naked. 4 For we that are in this tabernacle do groan, being burdened: not for that we would be unclothed, but clothed upon, that mortality might be swallowed up of life . 5 Now he that hath wrought us for the selfsame thing is God, who also hath given unto us the earnest (down payment) of the Spirit. 6 Therefore we are always confident, knowing that, whilst we are at home in the body, we are absent from the Lord: 7 (For we walk by faith, not by sight:) 8 We are confident, I say, and willing rather to be absent from the body, and to be present with the Lord. 9 Wherefore we labour, that, whether present or absent, we may be accepted of him. 10 For we must all appear before the judgment seat of Christ; that every one may receive the things done in his body, according to that he hath done, whether it be good or bad. When shall we be "present with the Lord"??? 1 Thessalonians 2:19 "For what is our hope, or joy, or crown of rejoicing? Are not even ye in the presence of our Lord Jesus Christ at his coming ?" Philippians 1:20-23 "According to my earnest expectation and my hope, that in nothing I shall be ashamed, but that with all boldness, as always, so now also Christ shall be magnified in my body, whether it be by life, or by death. For to me to live is Christ, and to die is gain. 22 But if I live in the flesh, this is the fruit of my labour: yet what I shall choose I wot not. For I am in a strait betwixt two, having a desire to depart, and to be with Christ; which is far better." When will Paul "be with the Christ"? Philippians 3:10 "That I may know him, and the power of his resurrection, and the fellowship of his sufferings, being made conformable unto his death; 11 If by any means I might attain unto the resurrection of the dead." Philippians 3:20-21 "For our conversation is in heaven; from whence also we look for the Saviour, the Lord Jesus Christ: Who shall change our vile body, that it may be fashioned like unto his glorious body, according to the working whereby he is able even to subdue all things unto himself." Even a child can see that Paul is not looking for some disembodied "spirit existence" after death apart from a physical body. He is looking and earnestly longing to be "clothed" with his immortal body at the second coming of Christ when Paul would be "present with the Lord". When Paul states that he is willing rather to be "absent from the body", he is referring to his earthly tabernacle so that he might be clothed with his "heavenly" house or tabernacle. Here are a few more texts to consider regarding how the word of God describes death. Acts 7:57 But they cried out with a loud voice, and stopped their ears, and rushed upon him with one accord; 58 and they cast him out of the city, and stoned him: and the witnesses laid down their garments at the feet of a young man named Saul. 59 And they stoned Stephen, calling upon the Lord, and saying, Lord Jesus, receive my spirit (pneuma - breath of life). 60 And he kneeled down, and cried with a loud voice, Lord, lay not this sin to their charge. And when he had said this, he fell asleep. Acts 13:32 And we bring you good tidings of the promise made unto the fathers, 33 that God hath fulfilled the same unto our children, in that he raised up Jesus; as also it is written in the second psalm, Thou art my Son, this day have I begotten thee. 34 And as concerning that he raised him up from the dead, now no more to return to corruption, he hath spoken on this wise, I will give you the holy and sure blessings of David. 35 Because he saith also in another psalm, Thou wilt not give Thy Holy One to see corruption. 36 For David, after he had in his own generation served the counsel of God, fell asleep, and was laid unto his fathers, and saw corruption: 37 but He whom God raised up saw no corruption. 38 Be it known unto you therefore, brethren, that through this man is proclaimed unto you remission of sins: 39 and by Him every one that believeth is justified from all things, from which ye could not be justified by the law of Moses. Judges 15:19 But God clave the hollow place that is in Lehi, and there came water thereout; and when he had drunk, his spirit came again, and he revived: wherefore the name thereof was called En-hakkore, which is in Lehi, unto this day. 20 And he judged Israel in the days of the Philistines twenty years. 1 Samuel 30:11 And they found an Egyptian in the field, and brought him to David, and gave him bread, and he did eat; and they made him drink water; 12 And they gave him a piece of a cake of figs, and two clusters of raisins: and when he had eaten, his spirit came again to him: for he had eaten no bread, nor drunk any water, three days and three nights. 1 Kings 10:4 And when the queen of Sheba had seen all the wisdom of Solomon, and the house that he had built, 5 and the food of his table, and the sitting of his servants, and the attendance of his ministers, and their apparel, and his cupbearers, and his ascent by which he went up unto the house of Jehovah; there was no more spirit in her . 6 And she said to the king, It was a true report that I heard in mine own land of thine acts, and of thy wisdom. Matthew 26:40 And he cometh unto the disciples, and findeth them asleep, and saith unto Peter, What, could ye not watch with me one hour? 41 Watch and pray, that ye enter not into temptation: the spirit indeed is willing, but the flesh is weak. Ephesians 4:20 But ye did not so learn Christ; 21 if so be that ye heard him, and were taught in him, even as truth is in Jesus: 22 that ye put away, as concerning your former manner of life, the old man, that waxeth corrupt after the lusts of deceit; 23 and that ye be renewed in the spirit of your mind, 24 and put on the new man, that after God hath been created in righteousness and holiness of truth. Job 33:4 The Spirit of God hath made me, And the breath of the Almighty giveth me life. Genesis 2:7 And the LORD God formed man of the dust of the ground, and breathed into his nostrils the breath of life; and man became a living soul (nephesh). Genesis 6:17 And I, behold, I do bring the flood of waters upon this earth, to destroy all flesh, wherein is the breath of life, from under heaven; everything that is in the earth shall die. 1 Kings 17:17 And it came to pass after these things, that the son of the woman, the mistress of the house, fell sick; and his sickness was so sore, that there was no breath (nesh-aw-maw: wind) left in him. 18 And she said unto Elijah, What have I to do with thee, O thou man of God? art thou come unto me to call my sin to remembrance, and to slay my son? 19 And he said unto her, Give me thy son. And he took him out of her bosom, and carried him up into a loft, where he abode, and laid him upon his own bed. 20 And he cried unto the LORD, and said, O LORD my God, hast thou also brought evil upon the widow with whom I sojourn, by slaying her son? 21 And he stretched himself upon the child three times, and cried unto the LORD, and said, O LORD my God, I pray thee, let this child's soul (Nephesh: life) come into him again. 22 And the LORD heard the voice of Elijah; and the soul (Nephesh: life) of the child came into him again, and he revived. When the phrase "give up (or yield up) the ghost" is used in the Old Testament, the word used is "gaw-vah" meaning "to breath out". Genesis 35:29 And Isaac gave up the ghost (gaw-vah: breathed out), and died (mooth), and was gathered unto his people, being old and full of days: and his sons Esau and Jacob buried him. Genesis 25:17 And these are the years of the life of Ishmael, an hundred and thirty and seven years: and he gave up the ghost (gaw-vah: breathed out) and died (mooth); and was gathered unto his people. Job 10: 18 Wherefore then hast thou brought me forth out of the womb? Oh that I had given up the ghost (gawvah: breathed out), and no eye had seen me! 19 I should have been as though I had not been; I should have been carried from the womb to the grave. Genesis 7:21 And all flesh died that moved upon the earth, both of fowl, and of cattle, and of beast, and of every creeping thing that creepeth upon the earth, and every man: 22 All in whose nostrils was the breath of life, of all that was in the dry land, died (mooth). In the New Testament: the writers used the same phrase "give up the ghost" as found in the Old Testament. In translating the phrase into Greek they used the noun "pneuma" as in a breath of air. Matthew 27:50 Jesus, when he had cried again with a loud voice, yielded up the ghost (pneuma - breath or spirit). John 19:30 When Jesus therefore had received the vinegar, he said, It is finished: and he bowed his head, and gave up the ghost (noun: pneuma - breath or spirit). James 2:26 For as the body without the spirit (pneuma: breath) is dead, so faith without works is dead also. Acts 7:59 And they stoned Stephen, calling upon God, and saying, Lord Jesus, receive my spirit (pneuma). 60 And he kneeled down, and cried with a loud voice, 'Lord, lay not this sin to their charge'. And when he had said this, he fell asleep. Finally we will briefly examine our Lord's statements regarding "eternal life" and "living for ever". From the following texts it is clear that eternal life for the repentant believer in Jesus comes at the day of resurrection on the Last Day, not at the day of death!! Christ makes it clear that the believer shall live again, not as a disembodied spirit but as a resurrected person with a glorified body. The Lord tells us that, though we die, yet we shall live; the believer merely sleeps, unaware of the passage of time, awaiting God's tomorrow at the last trump and the voice of the Archangel. John 6:40 And this is the will of him that sent me, that every one which seeth the Son, and believeth on him, may have everlasting life: and I will raise him up at the last day ..... 44 No man can come to me, except the Father which hath sent me draw him: and I will raise him up at the last day ......50 This is the bread which cometh down from heaven, that a man may eat thereof, and not die. 51 I am the living bread which came down from heaven: if any man eat of this bread, he shall live for ever: and the bread that I will give is my flesh, which I will give for the life of the world. 54 Whoso eateth my flesh, and drinketh my blood, hath eternal life; and I will raise him up at the last day. 55 For my flesh is meat indeed, and my blood is drink indeed. 56 He that eateth my flesh, and drinketh my blood, dwelleth in me, and I in him. 57 As the living Father hath sent me, and I live by the Father: so he that eateth me, even he shall live by me . John 11:21 Then said Martha unto Jesus, Lord, if thou hadst been here, my brother had not died. 22 But I know, that even now, whatsoever thou wilt ask of God, God will give it thee. 23 Jesus saith unto her, Thy brother shall rise again. 24 Martha saith unto him, I know that he shall rise again in the resurrection at the last day. 25 Jesus said unto her, I am the resurrection, and the life: he that believeth in me, though he were dead, yet shall he live: 26 And whosoever liveth and believeth in me shall never die. Believest thou this? Article of Faith # 4. We believe that "he who is justified by faith shall live" (Romans 1:17). Repentant sinners who put their faith in the atoning death of the Lord Jesus Christ are justified freely by God's unmerited grace alone through faith alone in the sinless life and atoning death of our Lord Jesus Christ alone and have the forgiveness of sin and the promise of eternal life and immortality. Just as repentant believers are reckoned perfectly righteous by faith alone, even so we have the gift of immortality by faith alone. The life and righteousness that we possess now are merely the small down payment of the righteousness and immortal life that we will have "by sight" at His coming. After the Fall of Adam, a flaming sword hedged the way to the Tree of Life so that Man could no longer eat of its fruit and "live forever". Thus sickness, suffering, and death entered the creation through Adam's sin. But that flaming sword of judgment has pierced our dear Savior's side, so that by the unmerited grace of God the redeemed sons and daughters of Adam will once again eat from the Tree of Life. At the coming of Jesus we shall shout, "O Death, where is thy sting? O Grave, where is thy victory?" Death has been swallowed up in victory through the blood of Calvary !!! And so death for believing repentant sinners is a mere moment of sleep from which we shall arise to be like Him. In a moment — in the twinkling of an eye — we shall put on perfect righteousness and immortality at the Last Trump. Just as in water baptism Christians are "buried" in the likeness of our Lord's death and "arise" in the likeness of His resurrection, even so we who fall asleep in death shall arise on the Last Day to everlasting life through the promise of the resurrection. See also this link. See also this link. Is the modern state of Israel the true "Israel" of God? What determines whether a man is a real son of Abraham? For in Christ Jesus neither circumcision availeth any thing, nor uncircumcision, but a new creature. And as many as walk according to this rule, peace be on them, and mercy, and upon the Israel of God. Gal. 6:15-16. To the Jew it was most important that he could prove he was a son of Abraham, for "to Abraham and his seed were the promises made." Gal. 3:16. The Pharisees were certain of being part of the Israel of God because they could trace their physical descent back to Abraham. John the Baptist declared that they were resting on a false confidence. ". . . think not to say within yourselves, We have Abraham to our father," he warned them, "for I say unto you, that God is able of these stones to raise up children unto Abraham." Matt. 3:9. Mere physical descent would give them no claim on God and no right to be included in the Israel of God. Again, the Pharisees said to Jesus, "Abraham is our father." John 8:39. But Jesus denied their confident claim, saying, "It ye were Abraham's children, ye would do the works of Abraham." John 8:39. Jesus categorically denied that they were children of Abraham. When Zaccheus showed by his works that he had the faith of Abraham, Jesus declared, "Today salvation has come to this house, since he also is a son of Abraham." Luke 19:9 RSV Jesus was not saying that Zaccheus was saved because he was a physical descendant of Abraham-for there were many Jews in Palestine who were not saved. Jesus was saying that Zaccheus' faith constituted him a real son of Abraham. The Lord could have said to him, as he said to the repentant woman, "Thy faith hath saved thee . . ." Luke 7:50. Again, Jesus greeted Nathaniel with the salutation, "Behold an Israelite indeed, in whom is no guile!" John 1:47. The word "indeed" signifies a true, or real, Israelite. Jesus therefore declared that a real Israelite is a man "in whom is no guile." According to Psalm 32, the guileless man is not a sinless man but the man who honestly continues to confess his sinfulness and who finds forgiveness at the hand of a merciful God. St. Paul cites Psalm 32 and shows that this guileless man (the Israelite "indeed") is the man who is justified by faith (see Rom. 4:1-8). For he is not a Jew, which is one outwardly; neither is that circumcision, which is outward in the flesh: but he is a Jew, which is one inwardly: and circumcision is that of the heart, in the spirit, and not in the letter; whose praise is not of men, but of God. Rom. 2:28-29. Neither, because they are the seed of Abraham, are they all children: but, In Isaac shall thy seed by called. That is, They which are the children of the flesh, these are not the children of God: but the children of the promise are counted for the seed. Rom. 9:7- 8.
. . . even as Abraham believed God, and it was accounted to him for righteousness. Know ye therefore that they which are of faith, the same are the children of Abraham. Gal. 3:6-7. And if ye be Christ's, then are ye Abraham's seed, and heirs according to the promise. Gal. 3:29. God made promises to the seed of Abraham. The Jews are still waiting for God to carry out His promises to them, and more amazing, many Christians are now waiting for God to carry out His promises to the Jewish nation as the seed of Abraham. This is what happens when people read the Old Testament without the light and interpretation of the New Testament. 1. God made promises to Abraham's seed (Gal. 3:19 ). 2. Christ is the Seed of Abraham. ("Now to Abraham and his seed were the promises made. He saith not, And to seeds, as of many; but as of One, And to thy Seed, which is Christ.") This is why Christ is called the Mediator of the covenant. It is only by Him, in Him and through Him that God carries out any of His promises to Abraham. ". . . if ye be Christ's, then are ye Abraham's seed, and heirs according to the promise." Gal. 3:29. When the apostle declares, "And so all Israel shall be saved . . ." (Rom. 11:26 ), he is certainly not teaching us that every member of the Jewish race will be saved. But the seed of Israel shall be saved - that is to say, all those who are in Jesus Christ - and not one shall be lost. Neither Jesus nor Paul is speaking in mere allegories when they tell us who are the children of Abraham. They are telling us who are real children of Abraham. Abraham was justified by faith and therefore became the father of Israel . All who are justified by faith are real children of Abraham (Gal. 3:8). The Seed of Israel is Jesus Christ. He is also the "King of the Jews." If a man is related to Jesus Christ, who can deny that he is a real Jew according to the Scriptures? For those who believe in Jesus Christ are born again (1 John 5:1), and they actually partake of the nature of Jesus Christ (2 Peter 1:4). The Judaisers at Galatia were contending that the Gentiles had to become children of Abraham by means of certain changes in their flesh. The apostle Paul did not dispute the necessity of Gentiles becoming part of the Israel of God. Indeed, "all Israel shall be saved," and only Israel - for as Jesus said, "salvation is of the Jews." John 4:22. The apostle refuted the wrong method of trying to incorporate the Gentiles into the Israel of God. His message was clear: Abraham was justified by faith, and every Gentile who is justified by faith becomes a son of Abraham (Gal. 3:8). The promises were made to the seed of Abraham, and Christ is that Seed. Therefore, all who are truly baptized into Christ are in Christ and are part of Abraham's seed (Gal. 3:28 , 29). Those who have become new creatures by faith in Jesus and walk according to the rule of faith are "the Israel of God." Gal. 6:15,16. For this is the covenant that I will make with the house of Israel after those days, saith the Lord; I will put My laws into their mind, and write them in their hearts: and I will be to them a God, and they shall be to Me a people . . . Heb. 8:10. The Israel of God are all those who are in Jesus Christ, the Seed of Abraham, the King of the Jews, the One to whom the promises were made. And in Jesus Christ all national distinctions are broken down. ". . . there is no difference between the Jew and the Greek . . ." Rom. 10:12 ."... ye are all one in Christ Jesus." Gal. 3:28. "There is one body, and one Spirit, even as ye are called in one hope of your calling; one Lord, one faith, one baptism . . ." Eph 4:4-5. Therefore, in the things of the gospel any national distinctions deny the reality of the atonement of Jesus Christ (Eph. 2:14 -17) and are a Judaising perversion of the New Testament message. There are some who take pride in their "literal" interpretation of the things of prophecy, especially Old Testament prophecy. No sound Bible scholar will deny that the Bible should be read in its historical-grammatical sense or that "literal wherever possible" is a good rule. But many prophecies of the Old Testament cannot be taken with strict literalness. The stone of stumbling to both houses of Israel was not a literal stone but Jesus Christ. Malachi's Elijah was not literally Elijah but John the Baptist. Many more examples could be given, but our point is this: How would we know the true interpretation without the New Testament? Does not the gospel determine our use of the Old Testament? Besides, a crass literalness is in keeping with the method of interpretation employed by the Pharisees. When Jesus gave a non-literal application to the Messianic prophecy about delivering the captives, they were angry. They refused to have anything to do with His spiritual kingdom, which could be seen and entered only by those who were born again. When Jesus spoke of destroying the temple and raising it up again, they insisted on giving His words a literal meaning. Jesus even had to rebuke his disciples for taking literally his warning, " . . . beware of the leaven of the Pharisees . . . " Matt. 16:11. Because they thought Jesus spoke about literal bread, He asked, "Do ye not yet understand . . .?" Matt. 16:9. Just as the Bible presents an old covenant and a new covenant, so it presents an old Israel and a new Israel. The old Israel was constituted under the twelve tribes named after the twelve sons of Jacob. When Jesus chose twelve apostles, He was taking steps to constitute the Christian church. Yet why did he deliberately choose twelve apostles? 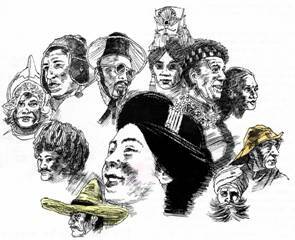 And why did the apostle James address the church as "the twelve tribes which are scattered abroad"? James 1:11. It was because the New Testament church, comprised of Jews and Gentiles, constituted the new Israel of God. When Christ died on the cross, national distinctions were ended. The old national religious economy was as extinct as the old covenant. Henceforth the Christian church, founded on the teachings of the twelve apostles, would be the new Israel , the inheritor of all the promises and responsibilities of Israel of the Old Testament. Abraham was justified by faith (Gen. 15:6; Rom. 4:3). Just as Abraham had two sons — Ishmael and Isaac — so there were always two classes of Jews. Not all were true sons of Abraham. The prophets frequently referred to the faithful remnant, who were the real children of Abraham. For all the promises of God in Him are yea, and in him Amen, unto the glory of God by us. 2 Cor. 1:20. 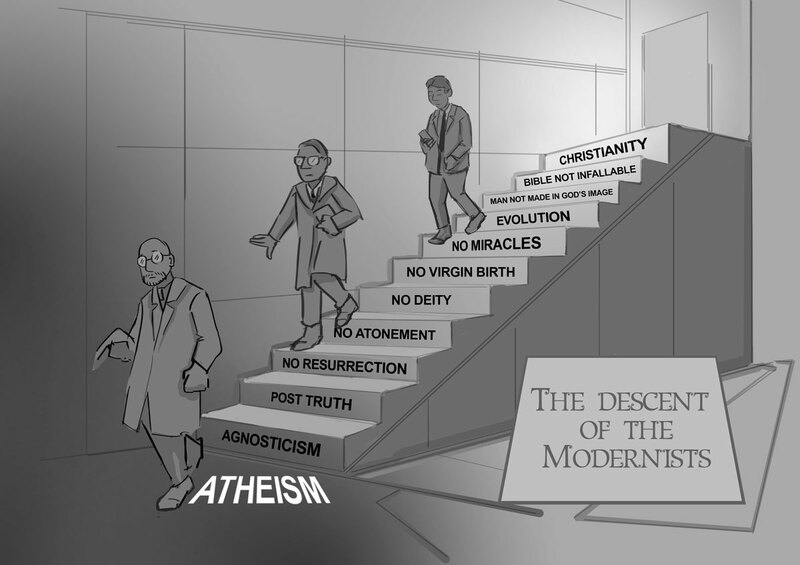 The Downward Stairway to Atheism. on the cross for your transgressions of God's Law!! God and faith in the atoning blood of Jesus!! who put their trust in the blood of Jesus. and of the Holy Spirit !!! Amen!!! will be repeated again in the future!! wondering after the beast of Rome. Babylon the Great has Fallen!!! 27 Hymns by "A Few Good Men"
Sung by "The Altar of Praise Chorale"
Sung by "Rusty and Tanya Goodman"
The composer Rusty died of cancer in 1990..
My Sheep Know My Voice!!! I'll Meet You in the Morning!!!! in the Blood of the Lamb?? The Sweetest Song I Know!!! When did the "last days" begin?? Why are Young People Leaving the Church and Becoming Agnostic? Did Jesus Know the Hour of His Coming??? is not true biblical faith!! What Does the Christian Faith Deny? 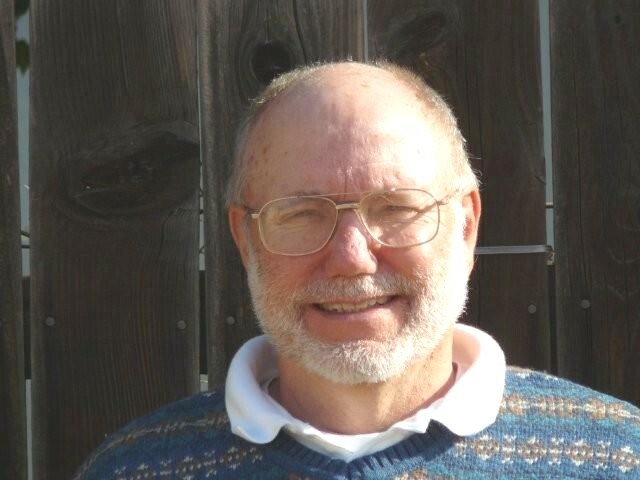 Video by Thomas Kindell, Ph.D. It's a Young Universe After All!!! to give the age of the universe??? Which translation of Genesis genealogy is best? A vast collection of on-line videos from the TV program "Creation Magazine Live" which covers just about every topic related to the creation / evolution debate. Is there a middle ground??? The Antichrist: Who is He? 20 Facts about the Sabbath Every Christian Must Know !!! what should you not believe? and what does it deny ?? God's Emphatic "No!" to Darwin!! Darwinism is the greatest hoax in all the world!! is God's emphatic "No!" to Darwin. his followers be finally destroyed? followed by a "seven-year tribulation period"? and a literal seven year "tribulation period"?? Who is the real "Antichrist"? of the first and second century A.D.? What heresy did they teach? Who was the heretic Cerinthus? of John the Apostle !! Docetism: a form of Gnostic heresy !!! "Esteeming one day above another "
in Romans 14:5??? or fast days??? A Symbol of Christ or Satan? of our acceptance with God? being taught in the Christian churches today!!! The Council of Dort and T.U.L.I.P. Where did the Council of Dort go wrong? Who Was Right: Luther or Calvin? Why was Adam's original sin so terrible? What does it mean to pray "in Jesus' name? the second is the non-Protestant view. 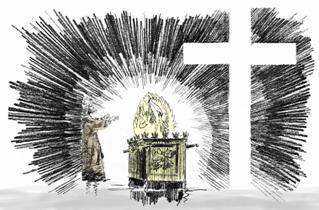 atoning death on the cross!!!! of Egypt during the exodus??? Who Do the 144,000 Symbolize?? ?